When it comes to Halloween, Hollywood knows how to have a good time. Last week we prepped you for a car-free Halloween, listing the various Metro accessible festivities happening around the city. My goal this year was to end up at the West Hollywood Carnaval since I missed it last year and I’ve since lived with that regret. There’s a number of ways to get to West Hollywood without a car from where I live in downtown. 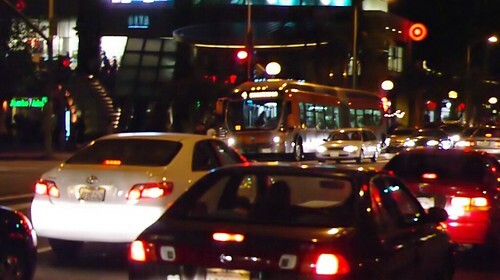 In 2007 I took Metro Line 4 along Santa Monica which was great until we hit the inevitable traffic on Santa Monica Boulevard leading up to the Carnaval and the bus slowed to a crawl. No big deal, we just got out and walked the rest of the way, our legs putting cars with 200 horsepower engines to shame. This year I tried something different. My car-free friends and I planned to take our bikes on the Red Line up to Hollywood/Highland and then pedal from there to WeHo. 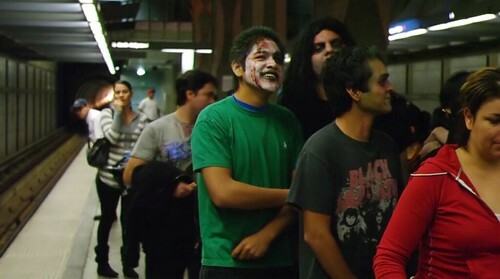 So we donned our costumes and made our way to the 7th Street Metro Center Station only to find the platform crowded with revelers in costumes. Obviously we weren’t the only ones with this idea. A North Hollywood bound train, just as crowded as the platform, arrived at the station right on time. We managed to squeeze on with our bikes and spread out amongst the rail car so we didn’t block too much room. Each station stop brought more costumed Metro riders aboard, and the demographic make-up of the straphangers ran the gamut. I saw teenaged girls, twenty-something hipsters, parents with young children carrying baskets full of candy, older folks – people of every race and culture. Despite the crowds and the cramped conditions, the diverse group was in high spirits and conversation and laughter was effortlessly shared between complete strangers. Those on the train who weren’t celebrating the holiday engaged their constumed companions with questions – asking what their plans were, who they were meant to be and where they were headed. A group of college-aged girls near me announced that they were headed to Santa Monica Boulevard and exited the train at the Vermont/Santa Monica Station. I didn’t find out whether their plan was to take Metro Line 4 to West Hollywood from there or if their plans were in the Vermont/Santa Monica area. Either way, it was clear their plan was to get there without a car. A mother and her young son got on the train at Vermont/Sunset Station. The boy was decked out in Ghostbusters gear and his mom was lugging around his sizable bag of candy. A 20-something gentleman with a scruffy beard and long locks offered his seat to the boy and his mother. The boy promptly sat down and soon led those around him in a choral rendition of the Ghostbusters theme song. Each time the train stopped at a crowded station, an announcement was made over the loudspeakers informing those on the platform that another train would be arriving in two minutes. When we arrived at Hollywood/Highland Station the vast majority of the riders made an exodus, and as I paused to film this parade of characters, sure enough two minutes later another train arrived with more costumed Metro riders. 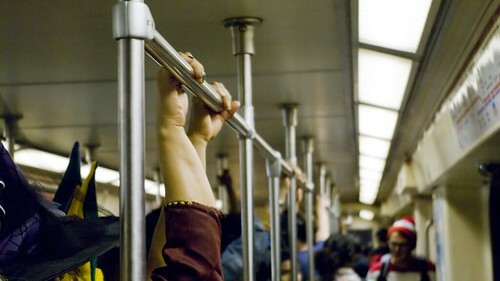 The stairways, escalators, and elevators flooded with people, but just as on the train, everyone remained affable. I imagined a different scene on the roads, where costumed revelers sat in their steel and glass tombs, idling along without the communal atmosphere of fun and excitement that those of us on the train shared. Outside the train station, Hollywood Boulevard was flooded with people, many of them coming from the subterranean tunnel we had just left. Once out of the crowd and onto the street, my car-free friends and I began pedaling down to Santa Monica Boulevard. Traffic was at a standstill at Highland Blvd. and Santa Monica. We tried to make our way through the sea of vehicles, but L.A.’s poor bicycle infrastructure reared its ugly head. With all the traffic there was literally no room for us to ride safely. It was either sit in traffic like a car, breathing in exhaust fumes, or find another route. So we rode up to Fountain Avenue and made our way west. There was less traffic, but the lack of bicycle friendly roads didn’t make it much fun. When we arrived at Fountain and La Cienga we locked our bikes up to a traffic sign (obviously there was no bike parking) and made our way down the single file sidewalks of West Hollywood to the Carnaval. I was shocked at how narrow the sidewalks on Fountain Avenue are. There’s enough room for a single person to head in one direction. Forget about riding a bike on the sidewalk or holding the hand of your significant other. And on this particular night, people were cramming these poor excuses for sidewalks well beyond their meager capacity. Annoying. After a few hours spent enjoying the human spectacle that is the West Hollywood Carnaval (I’ll spare you the details, but the phrase ‘extreme visual overload’ sums it up nicely) we hopped on our bikes and rode back o Hollywood and Highland just in time to catch the 12:40 a.m. Red Line train to downtown. The train was less crowded but still had its share of costumed revelers. While it was a more reserved ride than the trip to Hollywood, the sense of community remained as we all seemed to acknowledge that our car-free connection had brought us a night that so many others in Los Angeles have never taken the chance to experience.